Scores of 68*, 45 and 50 in the Twenty20 Internationals against Australia have lifted Babar Azam to the top spot among batsmen in the MRF Tyres ICC Men’s T20I Rankings. Azam topped the run-scorers’ chart with 163 runs from three outings, scoring at a strike rate of 117.26, as Pakistan swept Australia 3-0. That lifted him from No.5 to No.1, and pushed down Aaron Finch by a spot and compatriot Fakhar Zaman down to fifth spot, a fall of three places. The other big mover among the batsmen was Jason Roy, who smashed 69 in 36 balls in England’s 30-run win over Sri Lanka in their one-off fixture – Roy entered the top 10 with a jump of five spots, which put him at No.9 with a career-high 688 rating points. The most interesting development, however, came in the bowlers’ table, where we now have leg-spinners filling all the top five spots. Rashid Khan, Shadab Khan, Ish Sodhi and Yuzvendra Chahal held on to their positions in the top four, and were joined by Adil Rashid as the new No.5. Joe Denly was Player of the Match in his first international game since 2010 as England beat Sri Lanka by 30 runs. 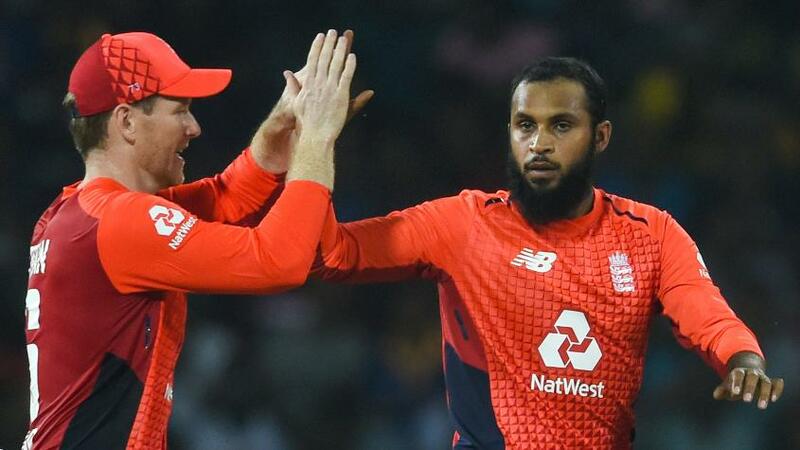 After Roy played the big part in giving England 187/8 on the board, Joe Denly (4/19) and Rashid (3/11) were outstanding as Sri Lanka were limited to 157. Denly was named Player of the Match, and Rashid moved into the top group with a career-best 676 points. Lots of other bowlers moved up too, including Pakistan’s Faheem Ashraf and Hasan Ali, and Australia’s Adam Zampa, but there were two other new faces in the top 10 – Billy Stanlake and Imad Wasim. The big Australian paceman picked up seven wickets in the T20Is against Pakistan and finished at No.9, a gain of nine spots, while the Pakistani left-arm spinner rose 14 spots to No.10. Wasim’s entry at the 10th spot, remarkably, made it nine spinners in the top ten. Samuel Badree from Windies and South Africa's Imran Tahir – both leg-spinners – retained their positions at No.7 and No.8 respectively. Mitchell Santner, the New Zealand left-arm spinner, is at No.6 – the only non-leg-spinner apart from Stanlake and Wasim. For all the ranking updates, click here.